Wealth Management professionals must constantly prove their value to the most sophisticated high net worth, super high net worth and wealthy clients on the planet. They are charged with building deep relationships with a group known for being incredibly private, guarded and dependent on multiple professional advisors. And, when the markets are volatile or a client's personal world is turned upside down for one reason or another, the High EQ Wealth Manager proves their value. Wealthy clients are all very different and all have different family structures, issues and personalities. The best-of-the-best thrive in these environments and are masters at relationship customization, crisis management and high volatility communication. 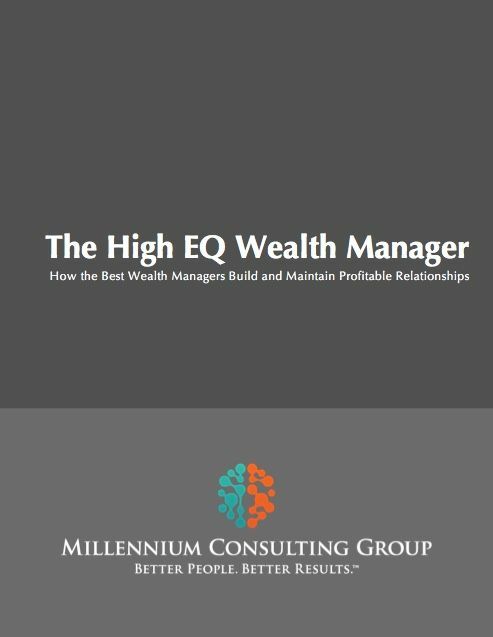 Our High EQ Wealth Manager workshop is designed to immediately and positively impact participant EQ levels by working with them to understand and develop the personal development and relationship development mindsets and skill sets of the most successful wealth managers in the industry. This fast paced, highly practical and highly interactive program takes the EQ discussion beyond general theory by delivering industry specific functional best-practices that will challenge participants to elevate the quality of their personal growth and relationship development efforts.